Tom Violet always thought that by the time he turned thirty-five, he'd have everything going for him. Fame. Fortune. A beautiful wife. A satisfying career as a successful novelist. A happy dog to greet him at the end of the day. The reality, though, is far different. He's got a wife, but their problems are bigger than he can even imagine. And he's written a novel, but the manuscript he's slaved over for years is currently hidden in his desk drawer while his father, an actual famous writer, just won the Pulitzer Prize for Fiction. His career, such that it is, involves mind-numbing corporate buzzwords, his pretentious archnemesis Gregory, and a hopeless, completely inappropriate crush on his favorite coworker. Oh . . . and his dog, according to the vet, is suffering from acute anxiety.Tom's life is crushing his soul, but he's decided to do something about it. (Really.) 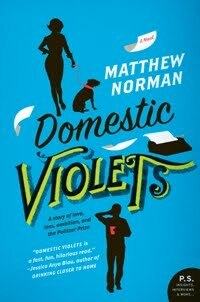 "Domestic Violets" is the brilliant and beguiling story of a man finally taking control of his own happiness--even if it means making a complete idiot of himself along the way. Novels satirizing corporate America have been done many times over. I was worried the theme would feel overdone, like a reworking of a book I have already read. Lucky for me, this wasn't the case at all. Domestic Violets was a fresh take on the disillusionment of corporate america and the "40-hour prison sentence." It had me laughing out loud and really rooting for Tom. I hoped he would figure out the obstacles holding him back and keeping him from growing to his full potential. (Not only is Tom struggling in the workplace, he is also falling short in the bedroom.) I wanted to see him succeed and I wanted him to be happy. I found myself concerned with his future, his marriage, and his career. Of course Tom is flawed and we watch him make mistakes along the way, some ridiculous and some reasonable. As it turns out, the novel is much more than a satire on corporate American. It also highlights the complications and oddness of modern family life, and the oddness of modern life itself. It's about not getting to where you thought you'd be at a certain point in your life and making the most out of where you are. It's about figuring out who you are and how you can get to where you'd like to be, and the struggles you face along the way. I am next to her, listening to her. I want to touch her but I can’t, because she’ll wake up and I’ll have to explain this. I want to touch her, but I can’t, because I’m angry at her and she’s angry with me, and even though I love her, I don’t like her as much as I should. She’s right next to me. I’m alone and she’s alone. We have never been farther apart. Because the central characters of this book are writers, there are a handful of jokes that center around famous authors and literary references. Those jokes were among my favorites. Overall, this is a funny and clever book. Norman's voice is fresh and cutting. I don't think it's a must read, but I did enjoy the novel very much. If you are looking for a humorous, intriguing plot, fully realized characters and some literary humor, this one is for you. I really loved this book. Humor is, in my opinion, very difficult to get right, and this book worked for me. As you say, it could have been really trite, but I felt, instead, that it was fresh and engaging. Absolutely. I think he got it all right with the timing. I really liked this book a lot. I loved Tom and some of the things he said had me laughing out loud. I also enjoyed reading about the complex relationship he had with his dad. That was a good subplot. I also liked the bits about his relationship with his daughter. The scene when he read her his book comes to mind. Something about the smell of her hair and everything was suddenly okay. This sounds good and I love funny books. As Picky said, humor can be hard to pull off so ti's always good to hear when it works out. I think you would like this one, Alley. I loved this book and am glad to see you enjoyed it! Tom was a great character to get involved with and I agree with you that the book was funny and clever. Definitely one of my favorite reads in 2011. I love hearing that a book is laugh out loud. Sometimes I get in a mood where that is just what I need. It is! It seriously is. I really enjoyed this book, too! This is one I accepted from NetGalley but never actually read. The premise put me off to the point that I didn't try very hard. BUT, after seeing lots of reviews like yours, I'm tempted to try again.